Enjoy your video games and multimedia content on a big screen with the Epson Home Cinema PRO-UHD 5050UBe HDR Pixel-Shift 4K UHD 3LCD Home Theater Projector. It uses pixel-shifting technology to project 4K UHD resolution onto the screen with compatible content and features HDR10 and HLG compatibility to produce a wide color gamut with compatible source content and equipment. 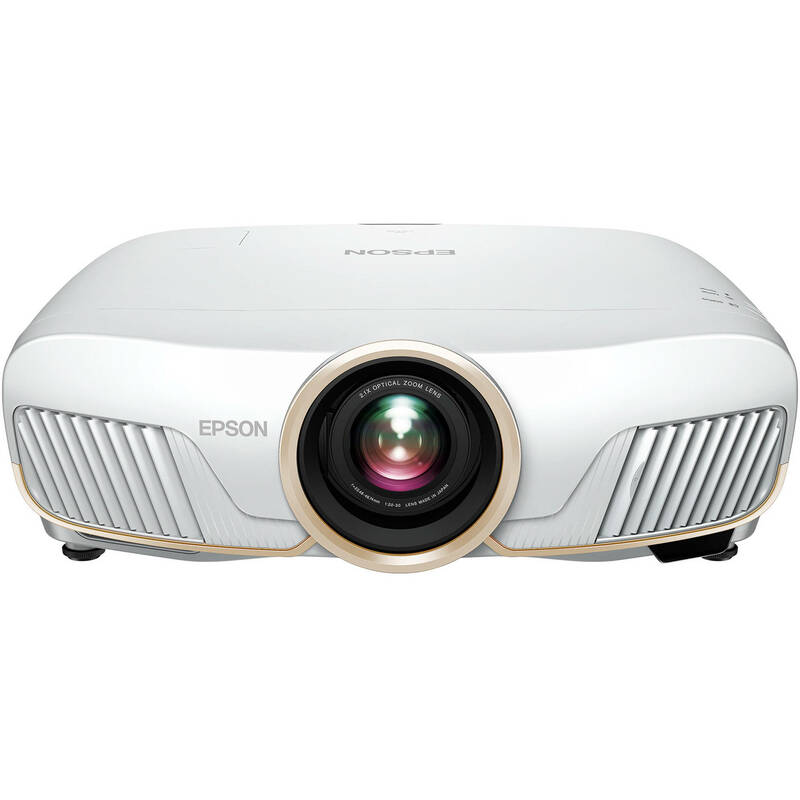 It outputs up to 2600 lumens of color and white brightness and has a 1,000,000:1 dynamic contrast ratio to help produce details even in dark areas of the image. The projector has two HDMI inputs for connecting your digital HD devices such as a gaming console, Blu-ray player, or cable/satellite box. A wireless HDMI hub is included that has four HDMI inputs, one HDMI output, and one optical output. The Home Cinema PRO-UHD 5050UBe also includes an IR remote control for additional convenience. The included wireless HDMI hub has four HDMI inputs, one HDMI output, and one optical audio output. The Home Cinema 5050UBe has a built-in wireless receiver designed specifically for this hub. The 10-bit color output and dynamic contrast ratio of up to 1,000,000:1 help provide a wide range of color and detail in both bright and dark scenes. Parallel pixel processing and a 3-chip architecture help provide enhanced color brightness and accuracy. 2600 lumens of color brightness and white brightness combine to provide rich color. The motorized lens provides powered focus, 2.1x zoom, and vertical & horizontal lens shift. This feature delivers up to 100% of the DCI-P3 color gamut in Digital Cinema Mode thanks to the 12-bit digital color processing chip. Low Delta E means accurate color reproduction. Epson's Advanced Projection Lens is designed to display a bright, uniform image with virtually no hot spots or chromatic aberrations. Without a color wheel, there's no distracting rainbow effect. Also, balanced color and white brightness means no white segments. Box Dimensions (LxWxH) 25.5 x 20.0 x 10.0"